Yesterday was a banner day for foraging. 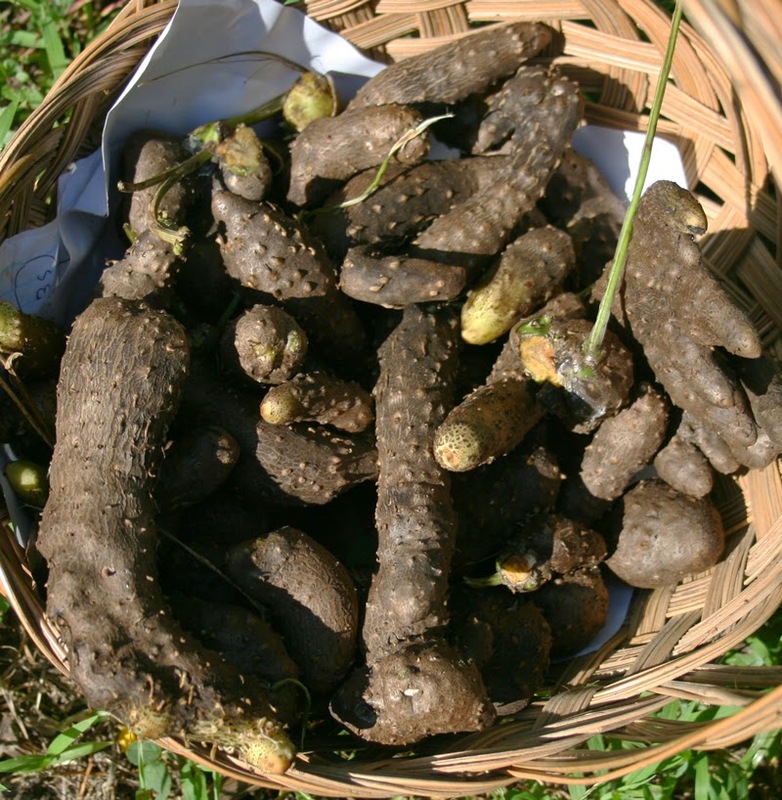 On my way to the bank I re-visited a vacant lot where I'd previously identified a good-sized colony of Dioscorea alata, the DELICIOUS winged yam, also known as the edible air potato. Unfortunately this species is listed as invasive, meaning I can't sell it in my nursery (and I can't send them to you in the mail... so don't ask)... but that doesn't mean I can't find it and eat it! Though I've eaten the roots before, I've never eaten the bulbils because they were generally small or few in number. This time I don't have that problem! After finding all these I called my brilliant friend Mart and asked how he prepares his bulbils. "Cooked until soft, just like a potato." Good deal. I'm going to have to see how they taste. After running my errands, it was time to pack up and go to the 326 Market for my afternoon plant sale. As I pulled in, Kathy (the organizer) told me I ought to check out the mushrooms and pick them before they got trampled. 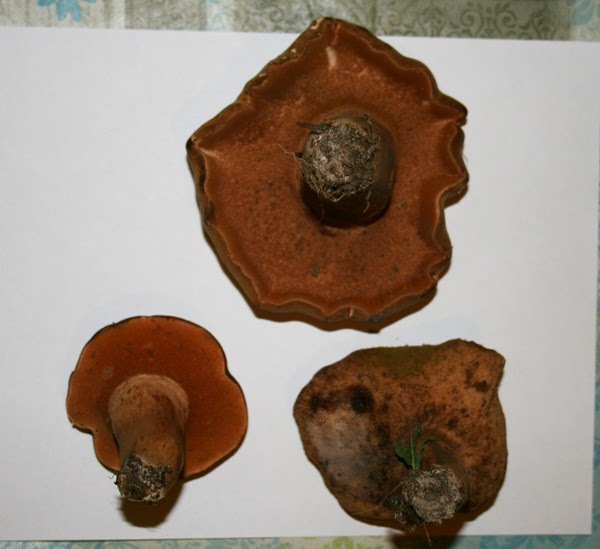 To my delight they were some variety of bolete and were in great shape. I'm 99% sure these are edible... but that last 1% keeps me from eating them. Mushrooms are nothing to play around with. I'm working on learning my species and the dangerous types but I'm not there yet. Unlike most plants, fungi can be super-duper crazy poisonous. Dang it. They smell and look delicious. At the Market I ran into many wonderful friends (Hi, all - you know who you are!) and met some new ones. The Dwarf Mulberries sold out and I also managed to give away quite a few peppers to people buying other things. I was also visited again by the wonderful gal (the older of the two) I wrote about here and we talked seeds, plants, writing and more about plants. I wish I knew which of these were edible and which were poisonous. I'll get there one day. 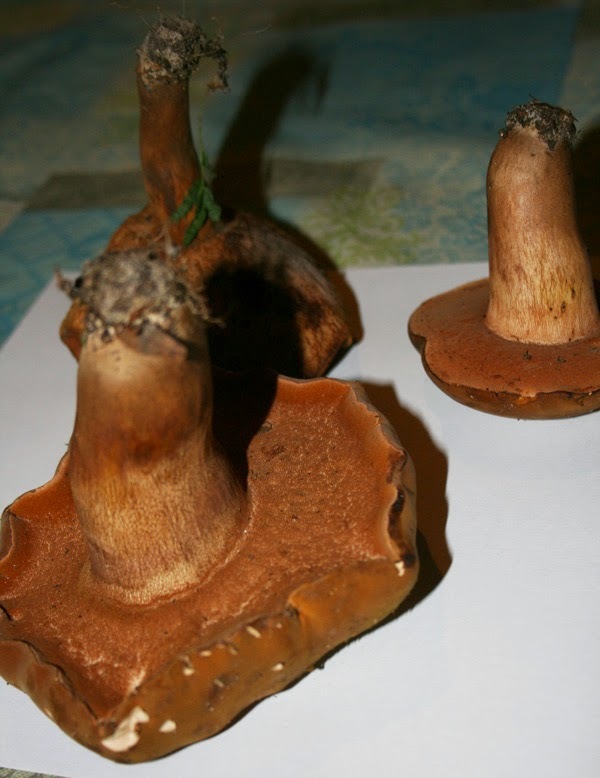 For now I'm taking notes and pictures as well as making spore prints. I'm also reading multiple books on mushrooms at the same time. Maybe next year I'll be brave enough to start eating what I find. Maybe. I love mushrooms, too! But, boy, like you, David, I'm scared to death (no pun intended) of eating wild ones. I was given some edible air potatoes about 5 years ago, told they were a pretty vine, and planted them. The vines have grown so large each year, despite my efforts to eradicate them( I too was told that they are invasive). I can agree with the invasive part, but now that I know that they are edible I will be a bit more forgiving of their enthusiasm. I'll have to try some at lunch. Yes. There are a few species which are always safe and easy to ID... and then there are thousands of others which take some expertise (which I don't have). I bought four books on mushrooms this last week and am soaking up all I can. Even if I don't eat them, at least I know they're great just as an addition to the yard thanks to their nutrient-gathering ability. If you know they're an edible type - go for it. True yams are delicious. Yesterday I was shopping at a local health food store, and I saw packages of dried mulberries for sale. Of course I thought of you. How long do mulberries take to start bearing fruit? I'm looking for something that would grow well in St. Louis and produce fruit the first year. Is there such a thing?